The Philippine government is now fully compliant with standards set by the European Maritime Safety Agency (Emsa), a body that screens seafarers from different parts of the world who aspire to work with European flag vessels, Transportation Secretary Arthur P. Tugade declared. In his recent meeting with International Maritime Organization (IMO) Secretary-General Kitack Lim in London, Tugade cited “a lot of positive developments” in the Philippine maritime industry over the past two years. He noted improvements in state processes, industry competitiveness and education of Filipino seafarers. Tugade’s effort is part of the government’s campaign to have the Philippines remain on a white list of countries for maritime manpower. It is feared that the country might be removed from the list should the government fail to tick off several issues on the country’s standards of training, certification and watch keeping (STCW) that were raised by the European body last year. Tugade presented to Lim the initiatives of the Maritime Industry Authority (Marina) that addressed the well-being of Filipino seafarers, citing the “hassle-free” issuance of seafarer’s identification and record book, the agency’s online appointment system, the removal of uniform rental fees for applicants, and the upgrading and automating of exams. The Filipino transportation chief committed to continue to support the initiatives of the IMO, and to continue to push for reforms and policies that will set the bar for a “world-class” local maritime industry. Marina, headed by administrator Leonardo B. Guerrero, is scheduled to present the developments of the local industry to the Emsa this month. In an interview, Guerrero said Marina will submit the compliance report to the European bloc’s agency, which listed last year several issues on the country’s standards of training, certification and watch keeping (STCW) that may remove the Philippines from the list of whitelisted countries. “We have already submitted our initial report. We intend to submit our compliance status this month, and by the end of October, we expect that somebody from Emsa will be contacting us for us to demonstrate the proof of evidence for compliance,” he said. He added that President Duterte’s issuance of Executive Order 63, which further strengthens the authority of Marina in implementing the 1978 International Convention on STCW, is another essential part of the measures being implemented. The said issuance harmonizes the administration of maritime education programs and fosters interagency cooperation framework among various government agencies, such as the Commission on Higher Education, Department of Health and the Philippine Coast Guard. It also ensures a stronger Marina representation in the technical panel on maritime education, and provides the agency a more explicit role and authority in the evaluation and inspection of maritime programs. Avior Director Joost Mes has written two articles about the issue and the different perspectives. Feb-15, The Philippines and the EMSA audit.... a glass half full or half empty. Jul-30 The Philippines and the EMSA Audit .... the glass revisited. “And what on earth have they taught you in school…..?”that was what I got to hear on my first failed attempt to get a position out of some sight bearings on my first watch as cadet. Many failed attempts followed but eventually I got pretty good at it. That was thirty five years ago. “And what do they teach those cadets in school these daysl” is what I am hearing now one generation later from returning senior officers when confronted with the slow progress of some cadets. So what is going wrong? Is education deteriorating over time or are we just struggling on how to turn learning into real competence? This is a question we have been juggling with for some time within Avior and in the Philippines. Is maritime education deteriorating over time and do we get lower and lower caliber cadets entering the industry? In other words, for those who have been at sea, were we any better prepared when we walked up that gangway for the first time than the cadets of today? If it is anything to go by when I compare my maritime classroom based education with that of the graduates of today I would say that if there is any change it is for the better. Introduction of simulators and competence based learned have made that today’s cadets are better prepared than I was. Having been involved extensively in cadet selection and development in the Philippines over the last fifteen years I do not think there is a noticeable difference in caliber of cadets and I dare say this is probably the case is most other countries. Yes cadets now are different from those one generation ago but so are our children when compared to ourselves at that age. So let’s stop blaming the educators and have a critical look at ourselves. 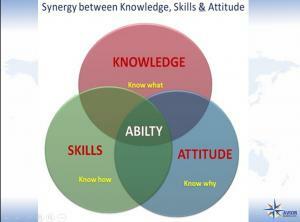 How do we turn knowledge into competence? 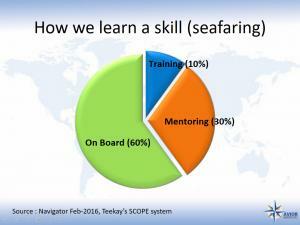 Seafaring still is a profession that to a large extent can be learned on the job. Once basic theory is taught in a classroom environment the real progress has to be made on board on the job whether we like it or not. According to Teekay in the Navigator issue of Feb-2016 actual classroom training is only a small part of learning a skill (10%). The major part has to come from learning how to apply knowledge on the job (60%) augmented by mentoring or coaching (30%). In the absence of any scientific research supporting this view one can argue the actual percentages but I believe the general message that on the job training and proper mentoring is more influential in achieving competence strikes a chord to many in the industry. We now use this figure in our discussion with Senior Officers to drive home the message that the solution is not more training ashore but better training on board. Sending a cadet to additional safety training can never replace good on the job safety guidance on board. Then in traditional seniority based contries like the Philippines there is another issue that makes for slow progress. Many of todays seniors in those settings have, much to their credit, progressed against all odds. They took a long time, climbed through the ranks, often self-taught and self-made. They did it the hard way and they now expect the same from today’s cadets. This combined with traditional modes of instruction makes for slow progress if not addressed. It is nice to make clear to a cadet he/she should start at the bottom and show mental strength because this is the way one had to progress in the past, but if this results in a year spend doing only odd jobs cleaning and rating-work then this does not abode well for progress and motivation. It will also not help in closing the gap with cadets from other countries some of whom come with a much better education and who are properly trained on board. In debriefing cadets we noted clear differences in progress linked to the development culture of the Company to which they are assigned and also to the nationality of senior officers. Ideally cadets should be on board with one purpose and one purpose only, to learn by doing. As such they are in addition to the operational crew levels. But when shipping gets into a downturn those berths are usually the first to go. Therefore we should also allow cadets to make themselves useful as part of the crew as in this way they are sort of self financing their training and as such they are less likely to be cancelled when the budgets get tight. But there should always be a good balance between learning and working. As a guideline within Avior we state that at least fifty percent of the time spend on board on completing Training Record Book and this is sufficient for most cadets to properly finish their Training Record Books. We also noted that we need to pay attention to the mode of transfering knowledge. The traditional methods of telling and observing yield very modest retention rates according research. Retention rates increase to seventy five percent if one actually tasked to do the job. 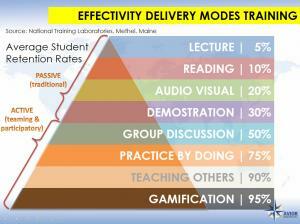 The newest kid on the block is ‘gamification’ which seems to yield superior retention rates (upto 95%). The innovative work of Atria Learning & Development to provide a simulation platform for Human Element In Shipping Simulation (HEISS) is at the forefront of this development in the maritime HR world and we have seen Principals implement this in their Crew Resource Management Training. Having made clear the importance of on the job training we now started a campaign to promote the art of mentoring. 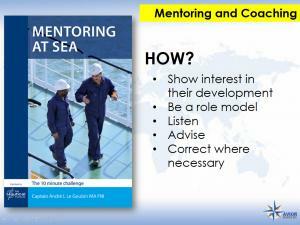 Coincidently this coincided with the Nautical Institute Navigator June-2017 issue on Mentoring. Most senior officers are aware that developing juniors is part of their job but they are just struggling on the how. Mentoring is an effective way in guiding juniors in their development but many barriers are usually seen on the way. One of the most commonly quoted barrier is “lack of time” and who can blame them. Smaller crews, more regulation and often juggling to satisfy hours of rest/work regimes. But mentoring does not have to take a lot of time. In his book “Mentoring at Sea” (published by the Nautical Institute), Captain Andre Le Goubin states that by consistently spending ten minutes a day on a junior his progress will be so much better. This can be just an informal chat to see how he is doing and what his next plans are or just a quick evaluation of past performance. Capt Goubin also addresses other perceived barriers to mentoring. Eventually we would like to go to “buddy” system where a junior is assigned to a senior who we know has shown the right capabilities to act as a mentor. Then finally if all this knowledge is turned into skills there is one more factor that determines whether the new learned skills will turn into real ability and this is “attitude”. Know why and when to apply the skill and his is very much an affair of Company culture and Personal Attitude. It is nice to have knowledge and skills but if one chooses to take shortcuts or for whatever reason not to apply the newly learned skill at all then still competence remains unachieved. - Development of juniors is part of the job. It has always been. - Development of juniors is also needed to sustain the manning pool and competitiveness. - At least fifty percent of working time on board should be spend on the Training Record Book related tasks. - That most of the work on creating competence will have to be done on board. On the job training is so much more effective than shore based training which contributes only ten percent. - That mentoring is an effective tool in guiding progress and it does not have to take too much time (“10-minute challenge”). 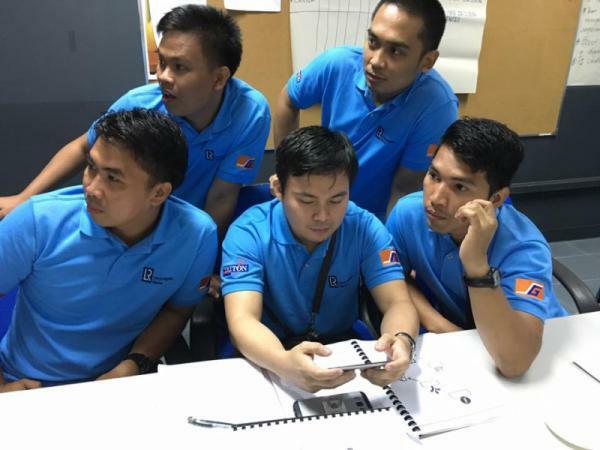 Avior rolled out new Human Element and Management training for junior officers last week at Giga Mare Inc training center in Subic. The simulation software provides gamificationn of case studies a new innovation in passing on real life scenario's to participants. Research suggests that gamifaication is the new frontier in passing on knowledge and skill training to an internet savy young generation as it achieves superior retention rates than all other existing modes for delivering training. The traiing is concluded with development interviews during which particiapnts sign off on their new development steps. "Turning Learning into Action"
On Monday March-13 Avior was the scene of an emergency drill organised by the Norwegian Hull Club and Avior Principal Alassia NewShips Management. The live exercise was centered around informing 'next of kin' about an incident on board and keeping control of communication channels and information. Other locations linked in the scenario were Alassia's Athens office, and off site 'actors. from Marine Benefits to act 'next of kin'-persons. Leading the scenario and briefing participants was Mr Gier Skoglund of the Norwegian Hull Club. 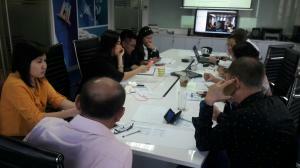 Apart from the Avior-Alassia team, also staff from Alassia's other agents Epsylon and Wallem participated in the exercise in the Avior Office. "Of course one hopes never to have to use what has been learned in this drill but there can be no complacency in being prepared" stated Avior Director Joost Mes. "Unfortunately those scenario's can hit you when you least expect them. It is also important for Seafarers to realize the importance of providing us upto date information on their next of kin". In this day and age of social media, keeping control of information and the communication channels is another concern. News travels so fast and this is one of the concerns we try to address through our media training. Responsible use of social media is what we promote. During the last Ship Management Summit held in Singapore Avior Dirctor Joost Mes was interviewed on his views on the present status and future of the Philippines Crew Management industry. With a predicted annual growth of 7% the Philippines is presently one of the fastest growing economies in the world. 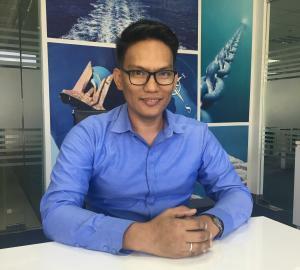 The interview conducted by Ship Management International's Felicity Landon looks into the drivers behind the Philippines as a major force in manning and the future ahead. For the full inteview CLICK HERE. In the interview Joost indicates that the two main drivers behind the growth of the Philippines into one of the major global manning sources are the demographics of the country with a large young professional population and the fact that a career at sea is still a very attractive career compared to shore based opportunities. This combined with the good English proficiency of most Filipino's and the ability to adjust to other cultures and working environments makes that the Philippines still is a preferred source for many Owners and Ship Managers. Competition from the shore based Business Process Outsourcing (BPO) industry growing with 90,000 jobs annualy has so far not substantially affected this as a career at sea still remains the better prospect in the long run. The present shipping crisis is hurting especially in the offshore but Joost indicates that one way or another the Philippines seems to weather the storm better than most countries. Probably because in time of recession Owners turn to the Philippines for Crew in an attempt to control costs. While China has overtaken the Philippines in terms of Seafarers the Philippines still remains numer one of one only takesinto account the Seafarers on the international fleet. However Joost emphasizes that it is not about being the biggest but about being the best and in this aspect the Philippines still has a few challenges to address. The Philippines is still not pulling its weight as far as the development of senior officers are concerned and making the leap to the higher end segments of the industry such as Ship Management and surveying. Things are definitely moving in that direction but slow.